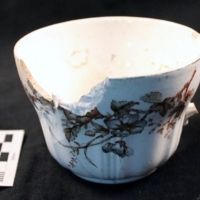 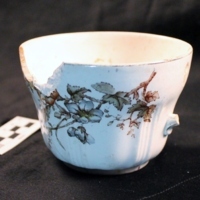 1 nearly complete whiteware cup, handle missing and small part of rim broken off (Item 3); "Art Nouveau" style of floral polychrome transfer print, mostly brown with coral and pale blue along with a thin gilt line on the rim. 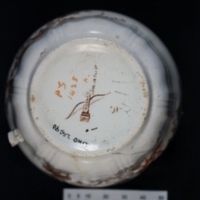 Maker's mark is arrow and quiver with "RIDGWAY/STOKE ON TRENT" in brown print along with "10"?, a gilding mark and coral colored hand written "PG 1425 ^" on base. 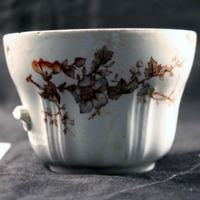 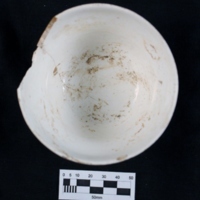 John Ridgway, “Whiteware Cup,” Midwest Transfer Print Ceramics, accessed April 19, 2019, http://midwesttransferprintceramics.org/items/show/132.